In celebration of Rosarium's fifth anniversary, publisher Bill Campbell has collected a two-volume collection of 100 science fiction, fantasy, and horror short stories from around the world. 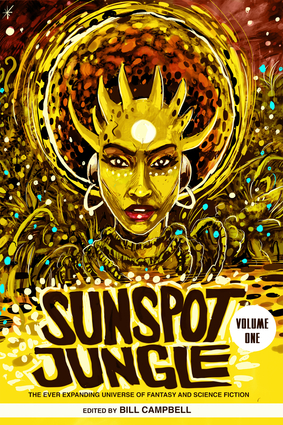 Like space and the future, Sunspot Jungle has no boundaries and celebrates the wide varieties and possibilities that this genre represents with some of the most notable names in the field. Bill Campbell is the author of Sunshine Patriots, My Booty Novel,Pop Culture: Politics, Puns, "Poohbutt" from a Liberal Stay-at-Home Dad and Koontown Killing Kaper. Along with Edward Austin Hall, he co-edited the groundbreaking anthology, Mothership: Tales from Afrofuturism and Beyond. Campbell lives in Washington, DC, where he spends his time with his family, helps produce audiobooks for the blind, and helms Rosarium Publishing.